I decided to take another shot at straightening my hair. I’ve been contemplating it all week, then today I discovered CristiGold in her video on CurlyNikki’s site and I was ready for the challenge. I swear she’s my hair twin! Last time I straightened it, I blow dried it, then used a curling iron to straighten it. I was overly nervous about burning my hair, so I didn’t straighten it that much. 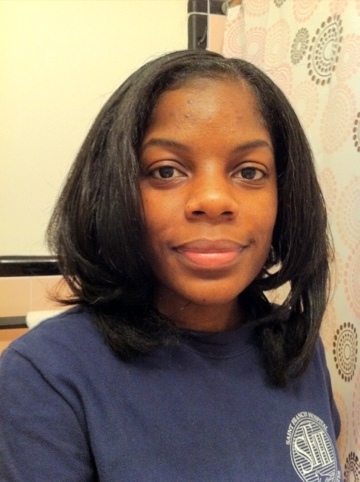 This time, I read this post that Curly Nikki did for Essence and decided to try this method. I washed my hair last night, deep conditioned, and braided it into 4 sections, then went to sleep. This afternoon after it completely dried, I unbraided and straightened one section at a time using the Instyler (forgot I had it). I used a lot of heat protector straightening serum as well. 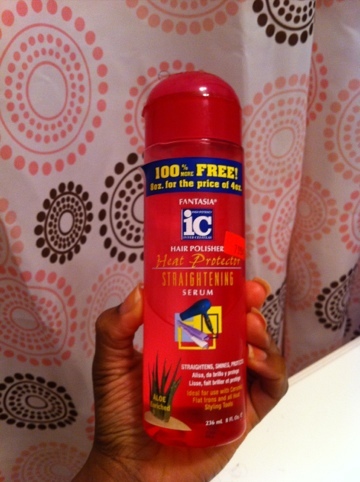 I always used this on my relaxed hair, so I still have it. I couldn’t straighten it and just leave my ends looking as raggedy as they looked, so I did trim them just a little. If my hair was longer, I would have trimmed about an inch off, which is what it really needs. I bumped the ends with a curling iron. My hair got really straight and smooth. I wrapped my hair and to smooth the ends after I wrapped it, you wouldn’t believe what I used… wait for it… wait for it… EcoStyler Gel mixed with hair protector straightening serum! I quickly put my scarf on my head after that. Let’s see how that works out. Without further ado, here’s my straightened hair. It’s so uneven, so it looks layered. I can’t wait to even it out… after it grows a lot more. 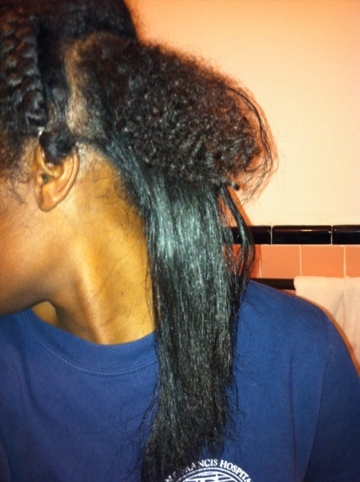 Look at how much shrinkage I have! Craziness! This was before the mini trim. Do you see those raggedy ends?!?! Not bad! Not bad! I just wonder if it would stay straight if I wore it out. Any tips to prevent frizz and prevent it from reverting?